Conversing with some ascetics in 2010 at Kedarnath Temple in Himalayas. 6000 Year old Kedarnath Temple, the highest among the twelve Jyotirlinga Shiva temples! Kedarnath is located in the Himalayas, about 3,583 meters (11,755 ft) above sea level near Chorabari Glacier, the head of river Mandakini, and is flanked by snow-capped peaks. 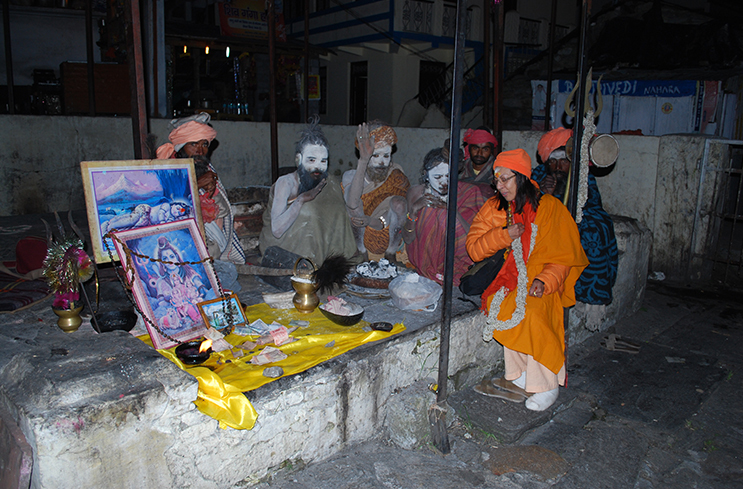 The nearest road head is at Gaurikund, at a distance of 14 km, and it is 223 km from Rishikesh. “Kedarnath is a very heady mixture of energies. This is a place that has witnessed thousands of yogis and mystics of every kind. When I say every kind, you cannot imagine those kinds. These are people who made no attempt to teach anything to anyone. Their way of making an offering to the world was by leaving their energies, their path, their work – everything – in a certain way in these spaces. When you think of someone on the spiritual path, you would probably think of them within a certain kind of framework in terms of a certain kind of behavior, dress or speech. But this is not a land of just that kind of spiritual person. The kind that fits into your ways of understanding has been here. But there have been many more who are utterly wild, whom you can never recognize as spiritual. But these are people who have touched the very peaks of existence. When we say “a yogi,” we do not mean someone of a certain behavior or morality. A yogi is perfectly in tune with life. So tuned in that he can dismantle life (for eg. Some exceptional kriyas in Kriya Yoga) and put it back together again. The fundamental life that is you, if you can dismantle that completely and put it back, only then you are a yogi. There have been many such incredible human beings. For a person who is seeking some kind of spiritual uplift, Kedar is a boon whose proportions one cannot imagine. That’s how it is, if one is open to this. It is very difficult to explain what it means. After all, it’s just a mountain, an outcrop of rock. But what makes an enormous difference is what has been done to the space by the type of people who lived here for thousands of years. This is the place where so many yogis shed their bodies. It is something one must experience. -	Source: The Isha Foundation website.